The Requirements: The Qedilizwe and Beverly Hills Senior Secondary Schools in Vereeniging, which fall under the Gauteng Department of Education (GDE), are two of eight schools that investigated the use of 21st century technology to enhance learning. The Solution: The schools purchased Sangari’s locally-developed science, technology, engineering and mathematics (STEM) educational tools and programmes. The iBox is now part of a GDE programme to support science, maths and life sciences at eight Dinaledi schools in Sedibeng West. The aim of the programme is to improve STEM learning with the goal to produce competent and knowledgeable engineers, doctors and chartered accountants in South Africa. The iBox is a learning system the size of a small suitcase that incorporates a projector, laptop, and built-in speakers, and is commonly used with an interactive whiteboard and wireless handheld clickers for learners. The unit projects curriculum-aligned class notes onto a screen in the classroom. Using a handheld tablet and electronic pen, the teacher is able to highlight important information and include additional notes and illustrations. The iBox system includes electronic wireless clickers, which are used by students to answer the questions posed during the lessons. The real-time information from the clickers provides teachers or learners with instant feedback. This feedback enables both teachers and learners to assess the learning that takes place in the classroom and allows teachers to make the necessary adjustments for effective learning. 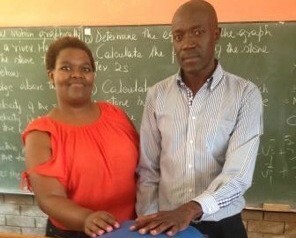 The Results: “Since the implementation of the iBox in 2011 there has been a marked improvement in maths and physical sciences results,” said Mr Gauta Legoete, Dinaledi co-ordinator for GDE for District 8. In 2009 the pass rate was 28%; this improved to 68% in 2013, which Mr Legoete attributes directly to the use of the iBox in the Dinaledi schools in the district. “The iBox makes teaching interesting. The PowerPoint lessons enable teachers to prepare more easily and follow the curriculum closely,” he said. “With learners interacting immediately after a lesson, slower learners are immediately identified and can be given further assistance. Each learner’s overall understanding of a subject can be immediately evaluated. If the overall test results are poor, the teacher is able to re-focus on the necessary topic before proceeding to the next lesson, getting the entire class up to speed,” said Mr Legoete.